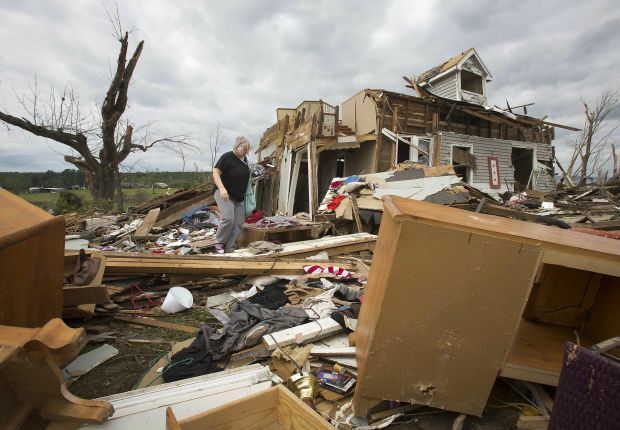 Catholic Charities agencies helping storm-damaged southern U.S.
WASHINGTON (CNS) — Catholic Charities agencies were on the ground assessing damage after a series of storms with deadly tornadoes and massive floods swept through the southern United States April 27-29. The storms killed 35 people and left thousands without power while razing homes and businesses. Arkansas and Mississippi were the hardest hit, but deaths also were reported in Oklahoma, Iowa, Alabama and Tennessee. Georgia residents lost power, and the Carolinas and Florida experienced flash floods. In areas hit by tornados, thousands of people forced out of their homes sought temporary shelter while the National Guard, local police and residents sifted through the rubble searching for victims. She said Catholic Charities USA had received requests for grants for financial assistance and is staying in close contact with Catholic dioceses and agencies in the damaged areas as they assess the needs in their communities. Patrick Gallaher, executive director of Catholic Charities of Arkansas, posted updates on the agency’s website, noting that the search and rescue phase of the relief effort finished April 30. He also said the overflow of donations made it impossible to store any other contributions until new collection points were established. “The immediate need of survivors is being met,” he said. St. Joseph Church in Conway, Ark., initially was used as an American Red Cross shelter, but the shelter was closed April 29 because not enough people were using it. Parishes in the Little Rock Diocese have been conducting their own drives to mobilize and collect donated materials. Gallaher said the local Catholic Charities agency continues to coordinate with other agencies to provide support during the cleanup phase and is gathering case managers for the rebuilding effort that will come in the months ahead. Greg Patin, executive director of Catholic Charities in Jackson, Miss., told Catholic News Service April 30 that staff members would begin to assess local needs May 1 after the first responders were finished their work. Once needs are assessed, he said, “we will begin to provide what assistance we can,” but he also noted that the agency has limited staffing resources and will need volunteer assistance. The agency has reached out to the Knights of Columbus for help and is looking for monetary donations because it cannot accept donated goods at this time. To support Catholic Charities’ disaster relief effort, visit their website at https://support.catholiccharitiesusa.org, call 1-800-919-9338, or mail a donation to Catholic Charities USA P.O. Box 17066, Baltimore, Md., 21297-1066.